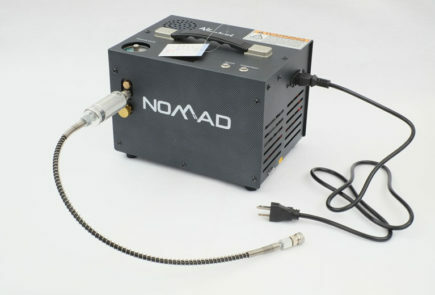 How Much CO2 Does A 12 Gram CO2 Cartridge Contain? You can check out the previous parts of this review from this link. 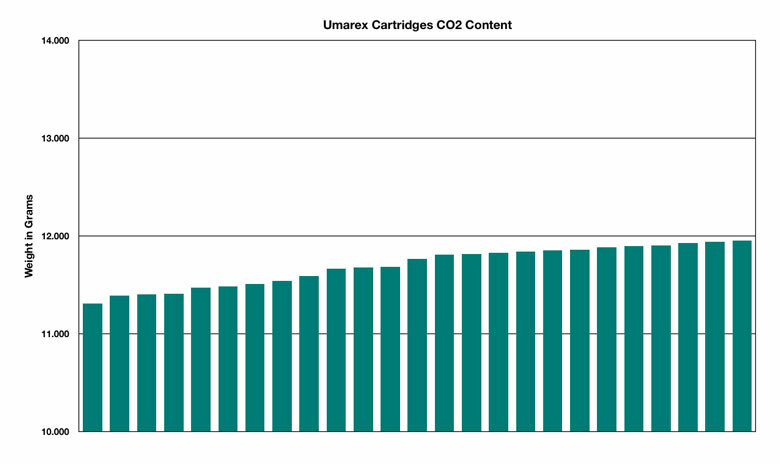 Umarex 12 Gram CO2 Cartridge Data. 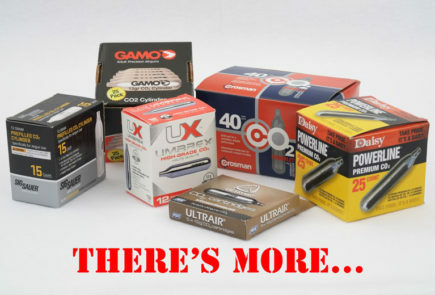 Umarex 12 Gram CO2s are available in boxes of 12 or 288. The company takes a different approach to all the other 12 Gram CO2 cartridge vendors by including a separate printed instruction sheet in every box. It’s actually quite useful! 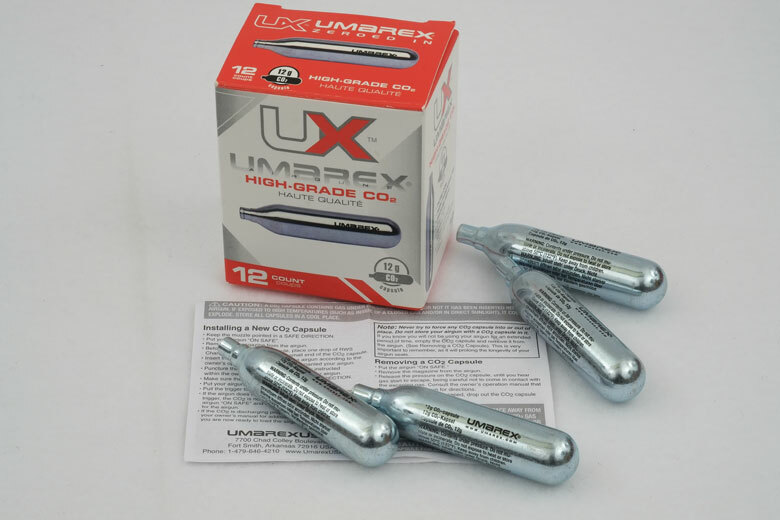 Like several other 12 Gram CO2 cartridge suppliers, Umarex has theirs manufactured in Taiwan. 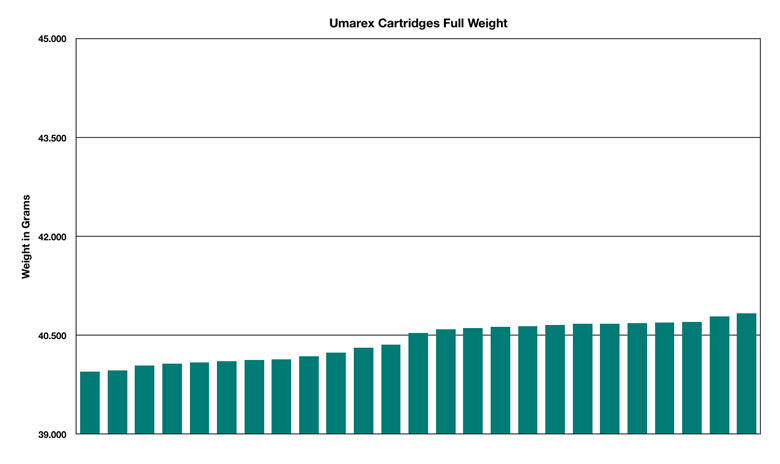 Out of the box, the Umarex CO2s averaged 11.697 Grams in weight. The heaviest weighed by HAM was 11.954 Grams, the lightest 11.307 Grams. 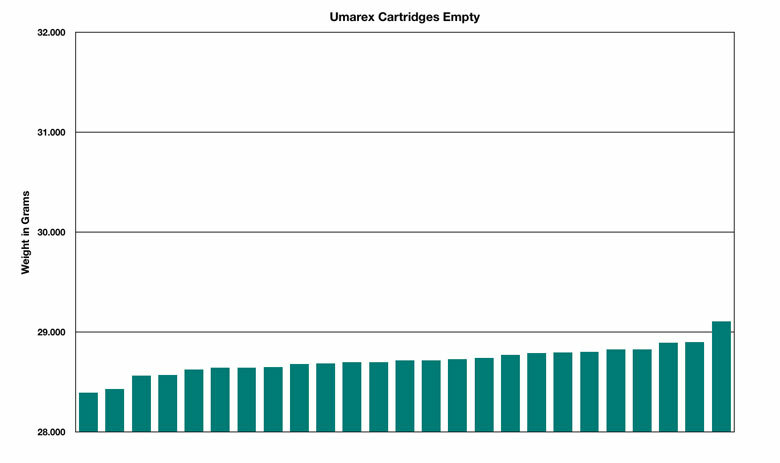 Empty weight for the Umarex 12 Gram CO2 cartridges averaged 28.716 Grams, with the lightest being 28.395 Grams and the heaviest 29.109 Grams. 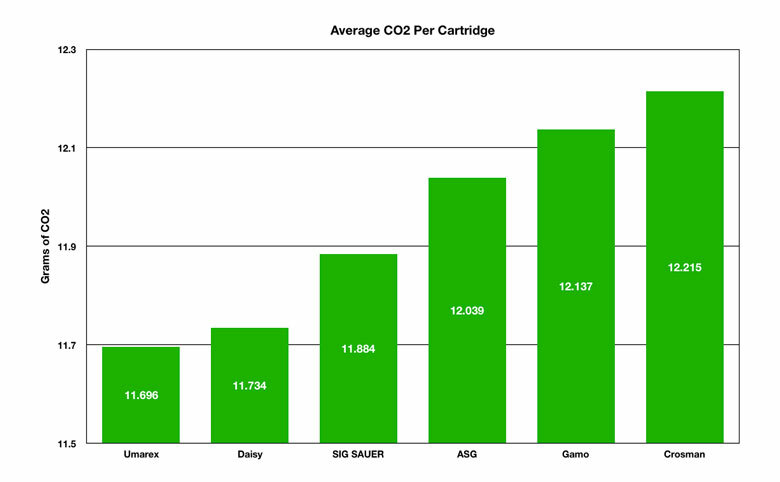 As before, these numbers allow us to calculate the amount of CO2 present in the cartridges. 12 Gram CO2 Cartridge Conclusions. So where does HAM Tester Doug Wall’s heroic efforts of weighing leave us? Well, we can see that not all 12 Gram CO2 cartridges actually contain 12 Grams of CO2 – as we rather expected before starting this mega review. But, the average weights of CO2 included in the various companies’ cartridges were all pretty close to 12 Grams, as we can see from this chart. 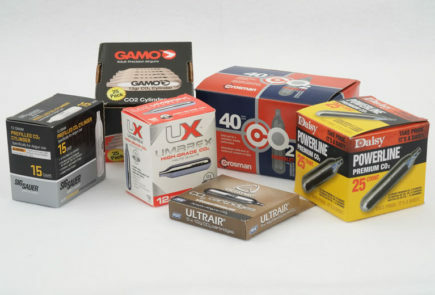 In the 12 gram CO2 cartridge samples tested by HAM, Crosman clearly provided the highest average CO2 fill, followed by the Gamo cartridges. As we saw earlier, the Crosman Powerlets are manufactured in the USA. The Gamos are produced in Hungary. All of the other 12 Gram CO2 cartridges in this HAM review were manufactured in Taiwan. Although I don’t know for sure, it seems likely that there’s only one company in Taiwan manufacturing CO2 cartridges. It’s called Banza Stamping. So, all the Taiwanese cartridges – branded ASG, SIG SAUER, Daisy and Umarex – probably came from the same production line. This leads us to conclude that – whatever their other benefits – the average 12 Gram CO2 cartridge produced in Taiwan is likely to contain just a little less than 12 Grams of CO2. But before we get too excited about these results, remember that whenever a 12 Gram CO2 cartridge in loaded into a firearms-replica air pistol, there’s almost always a little blast of CO2 as the cartridge is pierced. That’s a waste of CO2. And I’d be prepared to bet that it’s more gas lost than the amount any of the CO2 cartridges we tested contained less than 12 Grams of CO2! 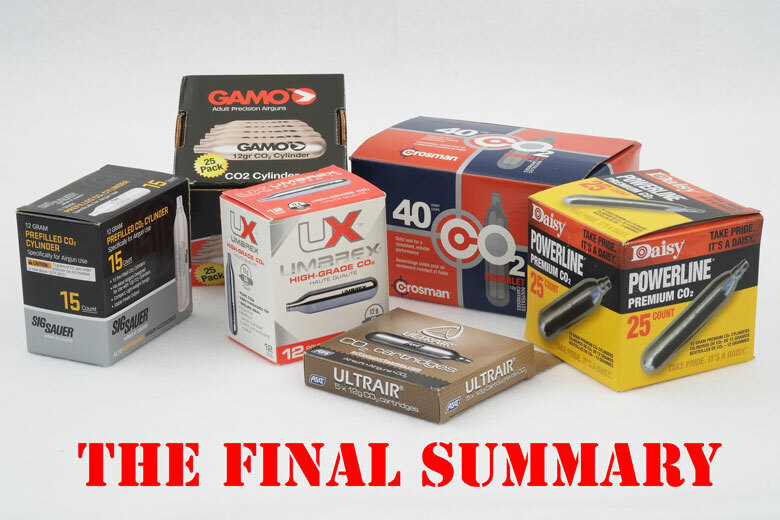 So, in future, when we count the number of shots available from any 12 Gram CO2-powered air pistol, we’ll need to allow for the manufacturing variation found in this review, plus the gas lost during the piercing process. Finally, A Note On Pricing. 12 Gram CO2 cartridges are pretty much a commodity product, yet prices are all over the map! A simple Internet search shows widely different prices being asked by different retailers for exactly the same product! However – as you would expect – there is a trend. If you buy CO2 cartridges in larger packs, they’re generally cheaper than a small number per pack. Of course, that’s also true with bottled water, beer and paper tissues, among many other products. Yet there are some pricing “rules of thumb”. 12 Gram CO2 cartridges typically retail for about $1.00 each in packs of 5. That unit price drops to about $0.60 to $0.70 each in boxes of 15 to 25. The “floor price” at retail seems to be about $0.44 each. If you can buy them for less that that, either you’re really doing well, or the retailer made a mistake!